There has been some confusion over the last few days over Google’s AdWords Keyword Planner and whether or not it includes organic traffic or if it just includes searches where an AdWords ad was available to be served. Glenn Gabe asked AdWords about whether these estimates were based on ads or all searches, and he was told at the time that it was for ad searches only. However, it seems that this information was incorrect. 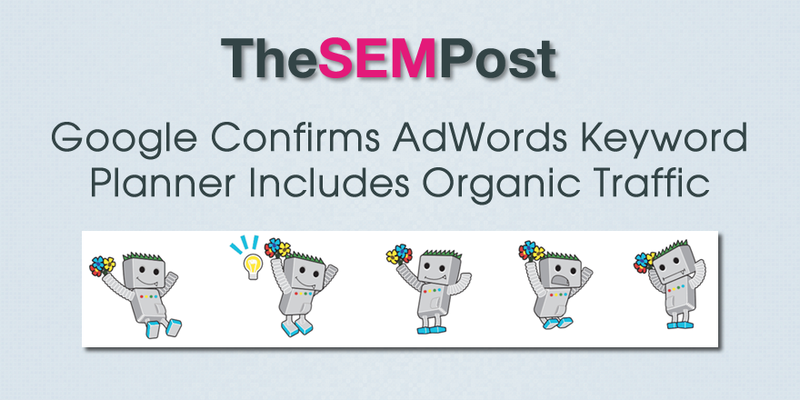 First, John Mueller tweeted a confirmation that the estimates do include organic traffic. I also confirmed with Google AdWords today, and they also stated that the tool looks at all searches, not just ad ones. The Keyword Planner has been getting some attention from SEOs for the past few weeks, as AdWords made a change to how they detail search volume. While previously Google was showing search traffic for individual keywords, they made the change to show it based on search variants. This change means that Google would only show data for groupings of keywords, but without detailing what queries would be included in that estimate. This change means traffic estimates are not nearly as valuable for marketers. There is hope that Google Search Console might possibly release their own version of this keyword tool for site owners and is interested in feedback about the change.